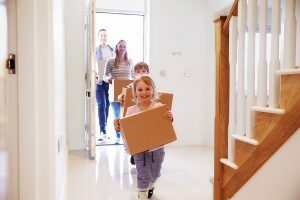 You closed on your new home, and now the time has come to pack you and your family’s belongings and make the big move. Moving is rarely on anybody’s “fun things to do” list and can bring on a lot of stress. That is why we, Nevada Gemme Real Estate, are here to help with your moving checklist. Change The Locks: You never know how many keys have been given to family members, workmen, or cleaning services unless you get new locks or re-key the existing locks. To keep you and your family safe, we suggest doing this right as you get the keys after closing. Are you Painting? : It does not matter if you are hiring a professional or painting yourself, painting an empty room is much faster and less mess. Painting is recommended a couple days before the movers arrive. If you are moving to an older home and cannot decide on a color scheme, focus on the major patching, priming, trim work, and base coats. This will give your home a finished look. Does your new home have crown molding? : If not, crown molding can add value to your new home. Crown molding is a design element that is popular and adds character to a home. Remember to prime and pre-paint the strips of molding before installation, just before painting the interior walls. Steam The Carpets: Unless you are planning on replacing the flooring, we recommend making sure the carpets are clean and free from all allergens from the past. Some real estate agents offer this after closing, be sure to check with your realtor. Protect your home from future pests: That includes mice, rats, bats, termites, roaches, and any other uninvited guests. There are many ways to get rid of pests, but if you need to get an expert, an initial visit from a pest removal service will run you $100 to $300, followed by monthly or quarterly visits at about $50 each time. Introduce Yourself to Your Circuit Breaker Box and Main Water Valve: Accidents happen, and sometimes when you cannot call a professional right away. To avoid stress, become aware and knowledgeable with your home’s electrical wiring in case of an emergency. It is usually a good idea to figure out which fuses control what parts of your house and label them accordingly. This can be done with 2 people. © 2019 Northern Nevada Regional Multiple Listing Service® MLS. All rights reserved. Information is deemed reliable but is not guaranteed accurate by the MLS or NVGemme Real Estate | Lori Gemme Real Estate. Real estate listings held by brokerage firms other than NVGemme Real Estate | Lori Gemme Real Estate are marked with the BROKER RECIPROCITY logo or the BROKER RECIPROCITY thumbnail logo and detailed information about them includes the name of the listing brokerage. The data relating to real estate for sale on this web site comes in part from the BROKER RECIPROCITY Program of the Northern Nevada Regional MLS and is for consumers' personal, non-commercial use and may not be used for any purpose other than to identify prospective properties consumers may be interested in purchasing. Data last updated: 2019-04-26T10:19:44.153.